Denna produkt ger dig 2228 bonuspoäng. Lastbil Magirus Merkur 120 S, längd 17 cm, epok III-IV. 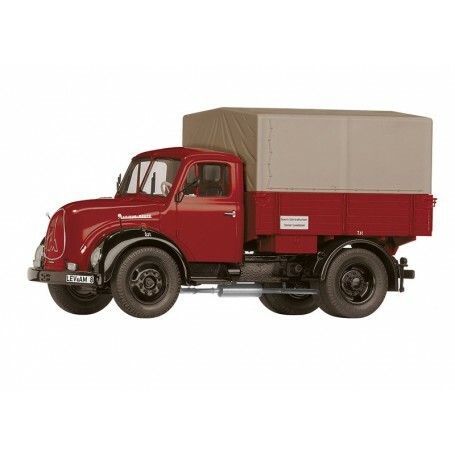 Magirus Merkur 120 S	Model: This is the Magirus Merkur 120 S delivery vehicle with a flatbed and a tarp superstructure. Also included is a kit for a wood shipping crate so that the model vehicle can be loaded with it. The model is finely detailed, equipped with locator rods on the fenders and mirrors, and it is being made of plastic with real rubber tires. Vehicle length approximately 17 cm / 6-11/16'. Prototype: Magirus Merkur 120 S so-called 'Rundhauber' / 'Curved Hood Truck' with a flatbed and a tarp superstructure.